I want a permit to dump blood in the sewer. I don't know when I would need to use such a permit, but I still want one. It happened about two weeks ago in Northeast Minneapolis near a lab that does medical testing and dumps blood into the sewer. It is allowed but the city is now making changes to help protect workers in the future. The Met Council said it was a mix of human and animal blood used in medical testing at this nearby lab. In fact, the company, R & D Systems, does have a permit to dump blood in the sewer system. The Met Council issued the permit. When asked if it's safe to have blood in the sewers, the Met Council said it is no more harmful than most other wastes in the sewer. The sanitary sewer system is the appropriate place for this type of liquid wastes. There are other companies that have permits to discharge blood in the sewer system. According to the Met Council, there are about four slaughterhouses, about 20 hospitals, and about a dozen medical and pharmaceutical companies that have permits. Battlestar Galactica meets The Office. Apparently, it can cost $30,000 to de-ice a 747. Plus fuel. And on March 16, planes went through multiple de-icings because of FAA policy. JFK made the news again with the storms on 2007-03-16. Airlines cancelled flights. Passengers had to spend hours of days in airports. And others sat on the tarmac for hours on end. This storm was different, though. Planes were allowed to fly, but had to take off within 25 minutes of being de-iced. The problem was that a plane can't de-ice and reach takeoff position in 25 minutes at JFK and and other highly congested airports. The FAA says they have to have this restriction in place. The airlines point out it is based on what they claim is a flawed study. This article goes into greater detail on the subject. It's been a big week for Play Cole. Star Trek: The Sitcom had more than 22,000 views, and The Muppet Showing Starring William Shatner is closing in on 20,000. There is now a new video at PlayCole.com. Open mike nights are a great chance to see new, aspiring comedians take their first shots at stardom. Sometimes, a Ninja shows up. Some content/language may be NSFW. Alton Brown is a well known host on the Food Network. His main show, Good Eats, mixes science, history, and cooking tips to demystify cooking. He also rates high on the geek meter. Here is his take on the e. Coli outbreak from last fall. I don’t want to sound like some crazy, anti-establishment bio-terrorist but maybe, just maybe this is a wakeup call. Truth is our food system has major flaws which point to one reoccurring theme: too much of our food is produced by centralized, industrial concerns. At this hour the continued suspicion is that the spinach, which may have been infected by irrigation water in a field, incorrectly composted manure used as fertilizer on organic crops, or by water used in processing. It may be quite a while before we know. 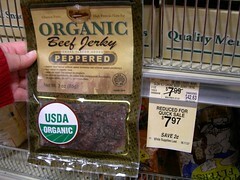 Had the big chain grocers and restaurant suppliers purchased locally grown produce, this wouldn’t have happened. But don’t blame them. Nope. Blame us. By demanding fresh spinach year round (or anything else for that matter) we create the monster. And to make matters worse, our ever-wise government has told us to eat no fresh spinach at all. They could have advised us to eat only locally grown spinach but Noooooooo. Let’s shoot every poor farmer in America that’s doing his or her job in the foot. When you think about this, it's obvious. In fact, online piracy could be used as a strategy by record producers and movie folks to eliminate piracy altogether. But would anyone listen to the idea? And would there be anyone visionary enough to even dream up the concept? Let me outline the architecture and strategy that the music industry could deploy today. It would cost less than the horrible current strategy of lawsuits and futile threats. Basically, if we stop fighting piracy, prices fall, and illegal piracy is no longer worth it. It's an interesting idea. Come to think of it, this isn't that much different than the theories supporting the legalization of most drugs. This is about 6 kinds of awesome. Two days ago, I talked about the latest Play Cole hit -- Star Trek: The Sitcom. It's still growing faster than we ever could have imagined. As of Thursday night, more than 7,300 people have watched it. It made it on to both Fark.Com and Fazed.Net. What's interesting is that while both sites have a similar concept (though Fark is much bigger) the comments on Fark have been mostly positive, while the comments on Fazed have been mostly negative. The cultural breakdown between the two boards must be more significant than I expected. This will require further study. The video has also been picked up by Webjunk.TV and Blinx.com. If you would like to send any of your friends the video, you can click here to send my orignal post or direct them to http://www.playcole.com. I'm keeping my fingers crossed for 10,000 hits before the weekend is over. My birthday is next month, and the marketing department at Hilton Honors is on it. I haven't been to Europe in more than 15 years. Nonetheless Hilton offered me a special Birthday package -- if I go to Budapest. This is the strangest promo I've gotten. Between now and August 23, 2007, stay at the Hilton Budapest or the Hilton Budapest WestEnd and earn 1,000 Hilton HHonors bonus points per stay. I got my first Green Light on Fark yesterday. I've linked to stories I've found there in the past. Fark gets throusands of submissions a day, and only a select few make it to the public pages. Over the past year I've probably submitted 10 or 15 links. But yesterday my first submission was approved and made it to the video page. OK, so it's not like I got a short story published in the New Yorker, but it's still kind of cool from a geek perspective. It gets better though. It's actually a Play Cole video. Jon took and episode of Star Trek: The Next Generation and added a laugh track. Here it is. Because of Fark, this is the biggest launch we've had for any Play Cole video. In the first day, more than 3,300 people watched the video. It reached the top 50 comedy videos for You Tube yesterday, and it's popularity is growing. I originally saw this link on Fark.Com. Apparently LG TVs are freezing when someone watches CSI. This may be the oddest story I've seen in a while. Television manufacturer LG has failed to determine the source of a glitch in some of its televisions, which caused them to freeze when screening Nine Network's programs, despite being notified of the problem three weeks ago. When I was in Spokane a year and a half ago, I manged to get over to Riverfront Park for a couple hours. I took a bunch of pictures and just posted them to Flicker. Some of my favorites, though, aren't the landscape shots. They're the Macro shots -- the ones where I can get close to my subject. As I look back through the shots I've taken over the years, that seems to be a common theme. Here are a few of my favorite from that set. This is a great sketch that actually builds over its 4:16 length. Some of the jokes may be predictable but it's worth watching to the end. That's my favorite paragraph from a great article about Parkinson's Disease that appear in the March 2007 (15.03) issue of Wired. Author Steven Gulie talks about how he developed Parkinson's and how doctors treated the symptoms successfully by implanting electrodes directly in his brain and then installing essentially a brain pacemaker in his chest. It's a long article but a great read. The transcript also makes clear that al-Qaida wanted to down a second trans-Atlantic aircraft during would-be shoe bomber Richard Reid's operation. Mohammed said he was involved in planning the 2002 bombing of a Kenyan beach resort frequented by Israelis and the failed missile attack on an Israeli passenger jet after it took off from Mombasa, Kenya. He also said he was responsible for the bombing of a nightclub in Bali, Indonesia. In 2002, 202 were killed when two Bali nightclubs were bombed. Other plots he said he was responsible for included plans to attack the Sears Tower in Chicago, the Empire State Building and New York Stock Exchange, the Panama Canal, and Big Ben and Heathrow Airport in London -- none of which happened. He also claimed he shared responsibility for assassination attempts against Pope John Paul II and Pakistan's President Pervez Musharraf. Later, he claimed responsibilty for Adam Walsh's disappearce, said he admired the view from the Grassy Knoll, admitted to bombing an aircraft in New Mexico in 1947, and explained how he carried Syphilis to the new world in the 15 century. I shot these on Monday afternoon as we were on approach to SEATAC (SEA). I was on an Alaska Airlines flight from SNA to SEA. Ok. My hotel network connection seems to be limiting my upstream bandwidth so I can't post the pictures. Instead, here's and article about a traveling Sushi Chef. As he draws his knife through marbled tuna fillets, he connects with regulars who are willing to wait as long as a couple of hours to get their fix -- though after a month's wait, what's an hour or two more? One of my favorite NPR shows is "This American Life." It's a weekly hour long program that usually feature 3 people telling stories. It's the show that introduced me to the the work of David Sedaris and Sarah Vowell. The tales may be humorous or thought provoking. The may be poingnant or tender. But they are always captivating. It's also one of the few NPR shows that is not time sensitive; you can listen to a program weeks or months after it aired and it's still a good story. And now you can download the latest episodes for free. You can subscripbe through iTunes or just download the program straight from the website. Go ahead and post your score in the comments. The woman I regularly travel with is not happy with me tonight. NLL doesn't think I listen to her. While we were driving to the LAX Hilton tonight, she told me to take an exit. Unfortunately, she didn't tell me until it was too late to merge into that lane so I had to skip the exit. I could hear the huffiness in her voice as she scolded me, "Calculating Route. Prepare to exit on the right in 2.2 miles." Then she led me on a tour of the sketchiest neighborhoods around LAX. The she teamed up with the Taurus to put more of a scare into me. The Taurus starts yelling "Beep Beep Beep". (The Taurus doesn't communicate quite as well at my NLL). The Low Fuel Warning light flared up. But I had 30 miles more I could go on the the tank, and NLL was promising me we were just 12 miles from my destination. I forged ahead. Eventually, NLL took me to my hotel. I put her to sleep for the night and headed up to my room. Next time, I promise I'll listen more closely to my NeverLost Lady. You've seen my eyes before. My left eye has always been stronger than my right eye. You can see in pictures from when I was a little kid, my right eyelid was never quite as open as my left. Over time, my brain came to rely more on the input of my left eye. My contact lens/glasses prescription is roughly the same for both eyes, but I don't "see" as much with my right eye. The end result is that, for whatever reason, my right eye isn't quite as strong. So I'm trying to fix that. Each day I am wearing an eye patch over my left eye for about 30-60 minutes. I want my brain to get used to paying attention to my right eye. I hope to improve my overall vision, hand-eye coordination, and aim. So far, it's been a bit odd, though I've been doing this for just a few days. When I first did it, I found things were a little gray-er when I used just my right eye. And after a while, I started to develop a headache. That doesn't happen much anymore. I found my depth perception was not significantly affected. I expected greater problems with that when operating on just one eye. The fact that it wasn't affected could mean I just process the intellectual data well, or, more likely, my brain has gotten used to relying heavily on my left eye anyway, rather than letting the two work together. I'm sure the doctors are groaning about how this is impossible. I'm sure I'll imagine all sorts of conclusions in the weeks to come. If this works, it will be the cheapest workout program I've ever seen. 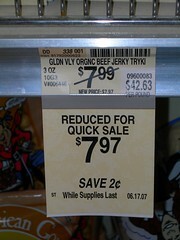 No one does discount meat quite like Safeway. On Thursday, my trade show let out early and I had a chance to wander the French Quarter during the day. Before the sun goes down, it's a vibrant exciting area. After dark, Bourbon ST and maybe Decatur ST are really the only places that seem "safe". The rest of the area is dark, all the stores are shuttered, and there is a thick desolation on the streets. After wandering the neighborhood during the day, I stumbled across Cafe Maspero on Decatur. Like many inexpensive places in the Quarter, it's a bar with a restaurant. If you go, bring cash. Because they don't take American Express. Or Visa. Or MasterCard. Or Blue Cross/Blue Shield. Fortunately, a good meal doesn't require much cash. For my late lunch, I ordered Red Beans & Rice and a Muffaletta. Red Beans & Rice is a traditional New Orleans dish. Despite the name, of course, it is not a vegetarian dish, and includes sausage or other meat. It was good, but not outstanding. If I go back here, I will probably skip this dish. I also had a Muffaletta. Fortunately I didn't read the description ahead of time. All I remembered was that a Muffaletta was a popular sandwich in Louisiana, and that I should have one if ever I go. The Muffaletta is a giant sandwich. The bread is round, instead of submarine style. The heart of it is the olive salad in the bread. I generally don't like olives. Sure, I appreciate a good olive oil, but I still pick them off my frozen pizza. In addition to the olive salad, it was loaded with meat, including pastrami. In some respects, it reminded me of the giant pastrami sandwich I had at Roxy's Deli in New York. I planned to have a decent lunch and later go out for a light dinner. But this lunch kept me full until I got to the airport the next morning. I enjoyed the decent sized Red Beans and Rice and the giant Muffaletta sandwich. I was there in late afternoon so there was plenty of space. No one looked at me strangely when I pulled out the notebooks computer on the ancient, deeply gouged wooden tables. Service was good as well. Over all, the food was good, but not great. But it was cheap and plentiful. So it may be worth a slot on the latter part of your New Orleans itinerary. After dinner at LA Bayou, I headed to the legendar Cafe Dumonde for dessert. Cafe DuMonde is a legendary New Orleans tradition. The original location in the French Market opened in 1862 and now is open 24 hours a day, 7 days a week. The menu is simple, featuring little beyond coffe and beignets. Beignets are light, fluffy pastries that are deep fried. Then, because that's just too healthy, they cover them in a couple inches of powdered sugar. I stopped by the outdoor cafe at about 11:00 PM and it was still hoppin'. I ordered a Cafe Au Lait (chicory coffee with milk) and, of course, Beignets. For $6, including tip, I had a great late night snack. I sat there reading my book and taking in the atmosphere in the moist, warm air of a February New Orleans night. I enjoyed the coffee (I know, you're shocked) but wasn't blown away by it. It's still a great pairing with the pastries. The sugar covered Beignets are a must have. They were fluffy and just slightly gooey inside. With the soft and crisp fried skin, I knew the AMA must be telling people, "DO NOT EAT" but I don't care. When you go to New Orleans, you have to fnd time for the Beignets. Last night I got to the French Quarter a little early. I was there by 9:40. Most nights, after about 10:00 PM there are few restaurants open. By that point, the tenor of the party has changed and Bourbon ST is buried under the strains of live music -- everything from Blues and Country to Twisted Sister covers -- and "representatives" from the dozens of strip clubs Gentlemen's Lounges trying to entice all visitor to surrender all those stray Washingtons, Anthonys and Sacajaweas. But as I said, I was there a little early last night and made it to La Bayou before the closed for the night. It seemed lively, but not obnoxiously so. There was no band. And, though I arrived just about 20-30 minutes before closing time, they still made me feel welcome. I sat at the bar next an ice encased Vodka Tap. I'm not sure why you need a tap for vodka. It's not Guinness. In fact, it's about as far opposite from Guinness as you can get and still be called alcohol. I had a cup of gumbo and a craw fish pasta. The Gumbo was excellent. It was almost as good as the gumbo I had at Remoulade. But not quite. I still should have just ordered giant bowls of it and called it good. I have now concluded that I have not had enough gumbo in my life. The rich smoky taste is a flavor I will forever associate with New Orleans. Next I had the craw fish pasta. It was pasta with deep fries craw fish meat in a Creole cream sauce. It was also quite satisfying, but didn't quite blow me away. And I don't thing I could tell the difference between deep fried craw fish and popcorn shrimp. Actually, I'm not sure I could tell the difference between uncooked craw fish and uncooked shrimp. I'm pretty sure they're the same animal and Emerill had been lying to us all these years. The french bread they served with pasta was warm, fresh, and the butter just oozed down my arm. I had an Abita with dinner and spent less than $30 total. Casual, simple, fast, and open. It's a tough combination to beat. Last night I got back from the trade show and promptly fell asleep. When I woke up, it was 11:00 PM and I was starving. So off to the Internet I went to try and find a French Quarter restaurant open late. I didn't have too much luck; there were a couple possibilities, but many of the websites haven't been updated for a post-Katrina world. But careful reading eventually paid off. The most important thing I read that night was the sandwich board outside the Tropical Isle that said "Food Now Being Served"
The Tropical Isle apparently has several branches in the area. They are best known for their Frightening beverage "The Hand Grenade." They carefully protect their trademark and keep the recipe a secret. Rumor has it that it contains copious amounts of Everclear. So for dinner I had a Shrimp Po Boy and fries, along with a Corona (I'll save the hand grenade for a time when I don't need the next few days). A Shrimp Po Boy is basically a small hero sandwich with deep fried shrimp, lettuce, tomato. Here's a sample recipe. The bread was a little over toasted. And, of course, the sandwich was almost impossible to eat with my hands. I made it work though. The plastic knife and fork couldn't quite cut it, and besides, I was reading a book at the time. (The trick to eating out alone is to bring reading material. The trick to reading while eating is to order things that do not require a knife). The shrimp was good, and overall, the sandwich was good, solid, late night bar food. The fries were great. They were the thinner-than-normal fries I am seeing more of these days. They were hot and crisp. Just what you want in a fry. Tropical Isle, like most Bourbon ST bars has live music. The singer/guitarist sang John Denver, Eric Clapton, Johnny Cash, and others. He was talented and did a good job even though there were only 3 or 4 customers in the bar. The food wasn't as wonderful as the dinner I had the night before, but for simple, late night fare and good bar food, The Tropical Isle is a fine choice.